“The best way to save taxes is to cut it short” well! that is what the policy of many Indian Autocar manufacturers recently. Few years ago Indian Government decided to give tax benefits to those cars which are under the sub 4 meter in length or has a 1.2 litre petrol or a 1.5 litre diesel engine, and Tata Motors started the trend and created one of their best sellers the Indigo, then Maruti Suzuki launched their Swift Dzire which also became very popular in the Indian market then we saw Honda launched their sub 4 meter saloon the Amaze in the Indian market recently. Now Mahindra also followed the same path and launched the Verito Vibe which actually is a sub 4 meter Verito, the shape of the Verito Vibe is really attractive yet confusing. It does not have an extended boot like the normal saloon but still it is not a complete hatchback either because it has a 330 litre boot at the rear and it cannot be accessed from inside the cabin of the car. 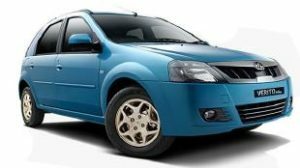 Mahindra Verito Vibe On road price starts from 6,41,500/-. Check for price details of Verito vibe in CarzPrice. This oil burner is based on a common rail direct injection fuel supply system and is efficient enough in delivering a decent mileage. On highways, it can stretch up to 21.03 Kmpl, whereas, when driven in the city traffic conditions, this figure minimizes to 18.01 Kmpl. Power of Mahindra Verito Vibe Its mill has four cylinders which further have eight valves and can generate a maximum power of 65bhp at 4000rpm and a peak torque output of 160Nm at 2000rpm.